Due to some combination of high quality earnings, durable competitive advantages and diverse underlying businesses there are a tiny number of investments that you could construct an entire portfolio around. Johnson & Johnson (NYSE:JNJ) stock is one of them. When you buy it what you are actually getting is around 250 different companies that span product categories ranging from consumer healthcare to pharmaceuticals, all under the headline Johnson & Johnson banner. It’s like owning a miniature healthcare fund captured in one company; one with a phenomenal track record of shareholder returns. A shareholder who bought Johnson & Johnson shares at the height of the Nifty Fifty craze, for example, would have found themselves paying nearly 60x earnings for the underlying business, yet in the following years they would find that investment had compounded at a rate of 11% a year. That’s the inflation adjusted equivalent of turning every $1 of stock in 1972 into $17 today. Despite the enormous evidence that holding Johnson & Johnson stock is one of the smartest investing decisions you can make you will still read no end of commentary focused almost exclusively on short term issues. Share price doesn’t go anywhere for a few years? Dead money. Growth is low for a couple of years? Must have a poor long-term outlook. The key to understanding why Johnson & Johnson is a core long-term hold is not going to be answered by the share price movement over the past six months. It won’t come in the form of a couple of quarters worth of earnings data either. The fact is that over any reasonable period of time the company has proven to be a certifiable cash machine and perennial wealth compounder. The only way to improve on Johnson & Johnson is to find an equivalently high quality stock at a similar valuation but with better prospects, or an equivalently high quality company with the same prospects but a lower valuation. That is crucial to long term investing and why it is imperative to avoid short term price action. Imagine buying the stock at the start of 2005 for example. You got a purchase price of $63 per share, paying 18x that year’s earnings with a 2.1% starting dividend yield. Seven years later the share price was only around the $65 mark, meaning you got virtually zero by way of capital appreciation over that time. 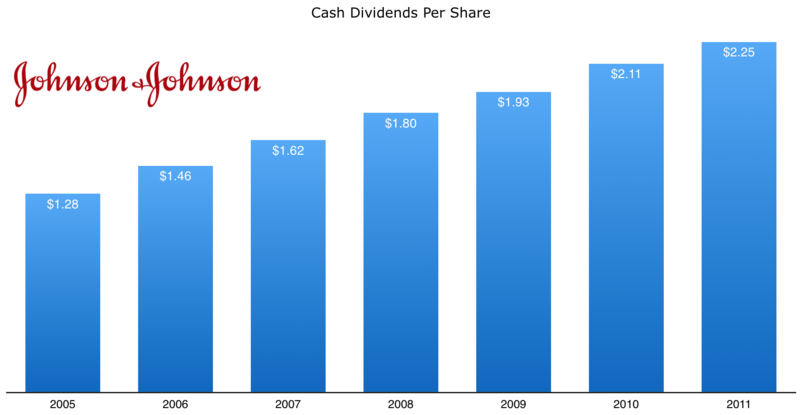 In addition a cumulative total of $12.435 a share in dividends was paid out (with an annual increase in each one of those seven years) and the company’s underlying earnings increased from $3.50 in 2005 to $5.10 in 2012 (excluding non-recurring charges). How many shareholders would respond to the ten years that Johnson & Johnson stock in investing purgatory by selling up? Rather than appreciate that the underlying business was fine they get despondent at the poor capital returns and decide to sell, thinking there are better opportunities out there. As it turned out there were spells in that decade in which there were literally no better long-term opportunities. During the turbulent market years of 2008 and 2009 the average annual P/E ratio was 13.5x. In 2011 you could buy the stock for just 12.7x times its an annual profits. This is for a compounding machine that had increased its dividend in each of the last fifty years. As it turns out anyone who sold up in 2012 has gone on to miss out on capital appreciation of 100% in four years, compounding at a rate of 18.9% a year. In addition there was another four years of consecutive dividend increases: from $2.40 per share in 2012 to $2.95 in 2015. That’s a growth rate of 7.1% compounded annually. Finally, there was a small increase in earnings-per-share, which went from $5.10 in 2012 to $5.48 for 2015 (and that was heavily impacted by foreign currency movements). Investor A buys the shares in April 2002 for a price of $63 at a P/E ratio of 28x that year’s profits. Investor B buys the stock in July 2002 for a price of $50 at a P/E of 22.4x that year’s profits. During those few months hardly anything changes with the underling business. It’s the same old Johnson & Johnson that has churned out profits and dividends for decades and regularly converts a high percentage of its sales into bottom line owner earnings. If it were a private company – let’s call it JNJ Limited – you wouldn’t bat an eyelid. From one day to next JNJ Limited would go about selling its goods and services and because its shares are privately held and aren’t tradable on any stock exchange its value would barely fluctuate in that time. As a private business you only need to concentrate on the most important thing – the underlying cashflow. But because of the large effect that multiple expansion or contraction has on returns it can end up amounting to thousands of dollars in profits. In this case investor A experienced annual compounded returns of 5% on his Johnson & Johnson stock compared to 6.75% for investor B. Overall that difference would amount to $6,000 on an initial $10,000 investment: a huge difference on two nearly identical investments made just three months apart. The other factors affecting long term returns will be per share earnings growth and the dividends. With Johnson & Johnson you’re at the point where you can comfortably take their 2.60% yield plus an ultra-conservative long term growth rate of about 6%. If 2016 earnings come in as analysts have forecasted then you will be looking at a PE ratio of just under 19x. At that point, and assuming you reinvest dividends, it’s hard not to see that being a solid investment over the next few decades.